I received a kind email from the Digital Assistant of Esquire UK informing me of Michael's cover story for the June Esquire UK issue. The images that we see so far reveal that this is going to be another wonderful interview with gorgeous pictures! 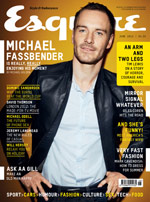 The entire interview can be read when you buy the magazine, but go to this link - http://www.esquire.co.uk/2012/04/michael-fassbender/ to read a portion of the interview with additional pictures of Michael! Thanks Essane! Essane is going to send me a complimentary copy of this issue! I am so excited! Here in the States, and especially here in the mid-west, we don't get UK publications until at least 4-6 weeks AFTER it's released in the UK. Sometimes an issue is even skipped. Just rude. ^^Thanks Anon for the link! OMG ! I have to get a copy of this ! I think these photos are one of the best of Fassy ! WOW WOW WOW ! I love shoots when Fassy smile like this =)))) Thanks Simone ! I received in the mail today, my complimentary Esquire issue from Esquire UK.